Only through an intensified dialogue between experts from numerous scientific disciplines a truly holistic picture of Marine Biodiversity can be gained. Understanding the complexity of the evolutionary and ecological processes that continuously change and threaten Marine Biodiversity requires a highly comprehensive scientific view. This can be achievable only by joining forces in multidisciplinary consortia. 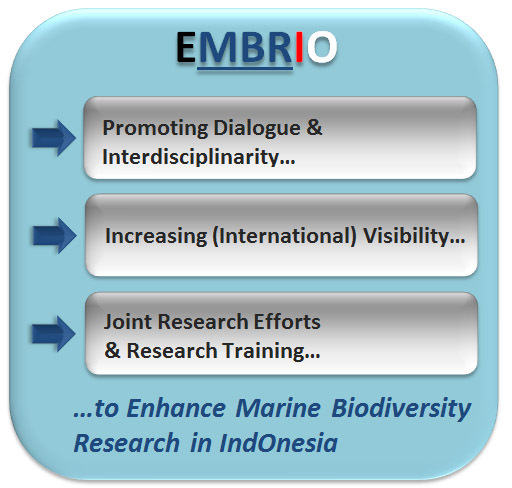 EMBRIO aims to bring together researchers and institutions from different disciplines to enhance the vigor and dynamism of Indonesian Marine Biodiversity Research to a state-of-the-art international level and to promote innovative projects at the interfaces of traditional research disciplines. Tackling global environmental challenges threatening Indonesian Marine Biodiversity requires multi-location studies and supra-regional counteractions achieved through collaborations across political borders. For the exploration and utilization of the biotechnological potential of Indonesian Marine Biodiversity resources advanced technologies are needed that are often not (yet) available in Indonesia. Strategic national and international partnerships, therefore, are of outstanding importance for the future development of marine biotechnology and the conservation of marine biodiversity resources as a treasure trove for the Indonesian people. 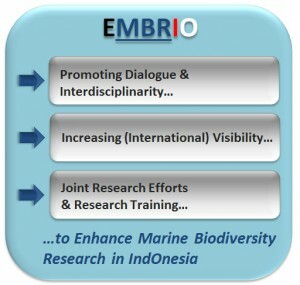 EMBRIO aims at increasing the transparence of Indonesian Marine Biodiversity Research for potential international partners, facilitating an overview of the strengths and focus areas of Indonesian researchers and opening a central gate for reliable international collaborators into the Indonesian scientific landscape. Last but not least, EMBRIO targets at promoting international exchange of (young) scientists through mutual research stays at the respective partner sites. For an efficient development of new technologies to utilize Indonesian Marine Biodiversity resources, the scientific value chain of Indonesian Marine Biodiversity Research has to be strengthened – from research to understand Marine Biodiversity, via its protection and rehabilitation all the way to its sustainable exploitation. Research of scientists working ‘downstream’ of this chain, e.g. in the industrial development of innovative biotechnology products from marine biodiversity resources has to be tightly integrated with research ‘upstream’ of the chain (e.g. for a fundamental understanding and protection/rehabilitation of marine biodiversity) to allow for true synergism, innovative approaches and sustainability. EMBRIO, therefore, aims to provide a platform both for multidisciplinary research consortia integrating the aspects of this value chain as well as for integrative research training for young scientists and students promoting this holistic view.